When someone says, “I coughed up blood,” it is always something that perks up my ears a bit. This symptom often brings on a host of additional questions, which leads to laboratory testing and imaging. Today we will discuss differential diagnoses, history and physical exam findings, as well as management of hemoptysis. The list of possible diagnoses related to the complaint of hemoptysis is extensive. 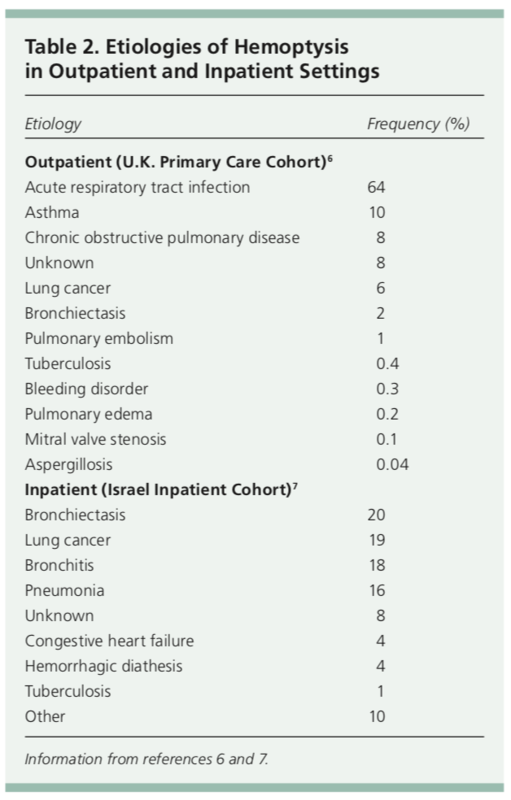 In the outpatient setting, URI, COPD, asthma, bronchiectasis, and malignancy are the most common causes seen. In comparison in a hospital setting the most common reasons found are lung cancer, bronchiectasis, and pneumonia, making up over 70 percent of cases. Just like with most symptoms, there are the typical things, and then the zebras. 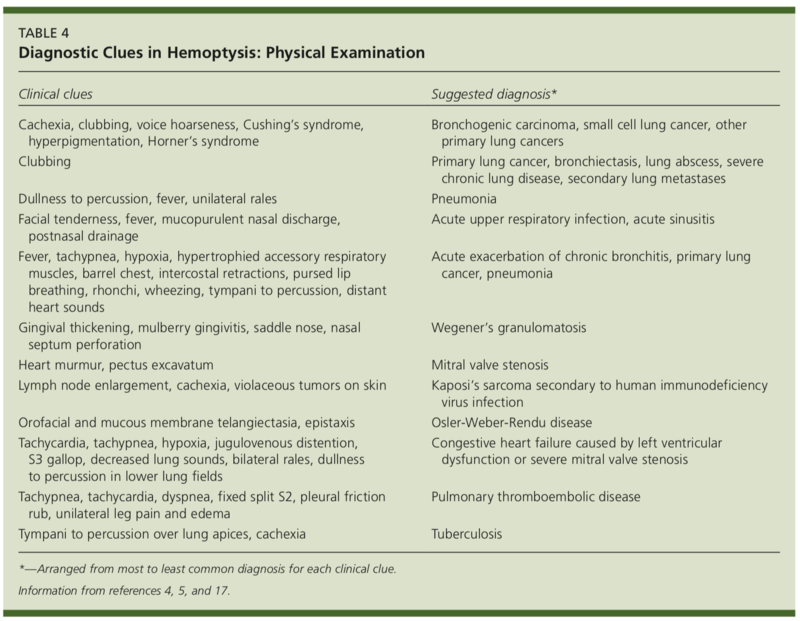 Below is a broad list of differential diagnoses for hemoptysis. The history should first aim to find the source of the bleeding. Non-lung pathologies (pseudohemoptysis) should be assessed for first as the etiology of the hemoptysis. These include an upper gastrointestinal source which can present as coffee ground emesis, darker colored hemoptysis, or nausea and vomiting. An upper respiratory source should be assessed as well, which may present as epistaxis, bleeding gums, or having little to no cough. A final etiology of pseudohemoptysis is the bacteria Serratia marcescens, which causes a red pigment that can be mistaken for blood. In this case, there would be no RBCs in the sputum, and culture would show growth of this bacteria. Next, we can move onto lower respiratory etiologies that could be the cause of true hemoptysis. There should be some signs and symptoms that should always come to mind when a patient says that they have been coughing up blood that can point us in one way or another regarding finding the diagnosis. One that can often be skipped over is asking if the patient is on an anticoagulant. This could be causing a coagulopathy, which indeed could potentially cause hemoptysis. Weight loss should be assessed in the patient’s chart and vital signs. If present this could be related to malignancy, tuberculosis, or COPD. The presence of a cough is not nearly as specific and has a list of differential diagnoses associated with it. These include COPD, foreign body, bronchiectasis, pneumonia, or tuberculosis. You should assess to see if any trauma was present which could point us towards airway trauma or possible pulmonary embolism. If fever is present, this may lead to further assessment for possible pneumonia, bronchitis, lung abscess, pulmonary embolism, tuberculosis, or malignancy. Sputum production should be assessed and if present might lead us towards bronchiectasis, pneumonia, tuberculosis, or COPD. A provider should always assess to see patient’s risk factors and past medical history for any findings that might point us towards congestive heart failure exacerbation that might be the cause of hemoptysis. Other symptoms that might be present if CHF is the cause include dyspnea on exertion, orthopnea, fatigue, pedal edema, or paroxysmal nocturnal dyspnea. Smoking history should be accounted for which might lead to COPD, malignancy, or bronchitis. A patient’s immune status should be evaluated, in which if immunosuppressed might make a lung abscess, pneumonia, tuberculosis, Kaposi’s sarcoma, or bronchitis more likely. Lastly, you should always ask if a patient has had recent surgery or immobilization for an extended period of time which is a risk factor for a pulmonary embolism. Other questions to hit on as well include a history of malignancy, travel history, and history of incarceration. When beginning the physical examination of a patient with hemoptysis, the stability and cardiopulmonary status of the patient should be assessed. If a patient’s vital signs are unstable, if there is hemodynamic instability, cardiopulmonary comorbidities, abnormal gas exchange, or at high risk of massive bleeding, the patient should be transported to the emergency room for further evaluation. If a patient is stable, there may be clinical findings on complete physical examination that point you to an underlying etiology as below. However, if a patient is unstable, having massive hemoptysis, inpatient admission and possible placement in ICU is often required. A scoring system can be used based on a patient’s symptoms which can help quickly identify an individual patient’s risk of mortality. If greater than two, this should lead to direct admission into the ICU. The scoring system is as below. Regarding the diagnosis and management of hemoptysis, this depends on if it is considered nonmassive or massive hemoptysis. This differentiation typically forks at, “is the patient stable?” and are the vital signs stable and non-fluctuating. Regardless if the hemoptysis is nonmassive or massive, some things should be completed in either situation. Chest radiography is regularly recommended is all cases of hemoptysis. However, the American College of Radiology supports holding off on CT scans of the chest as well as bronchoscopy, except for patients with abnormal chest x-rays, risk factors of malignancy, or recurrent and returning hemoptysis. 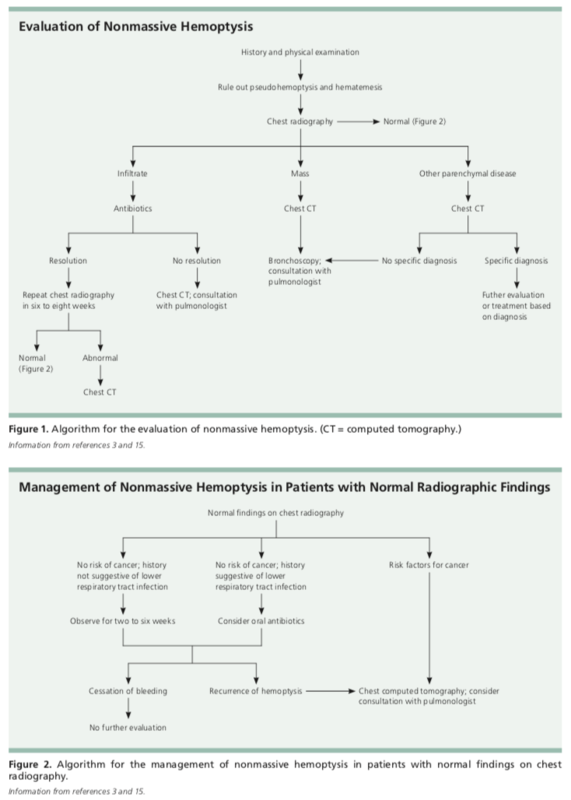 In cases of nonmassive hemoptysis, as mentioned above, these patients have normal vital signs and are hemodynamically stable with minimal blood production. A history and examination should be completed to assess for any information that may point to an underlying etiology for the hemoptysis. Next…. you guessed it, the patient should have a chest radiograph completed. Results of the chest x-ray will determine our next steps in care for the patient. If the chest imaging is normal, you then need to assess for risk of malignancy. If the patient has no risks of malignancy and the history and physical exam are not suggestive of a lower respiratory tract infection, observation for two to six weeks can be completed. At the end of that time period, if hemoptysis has halted, no further workup is needed. If hemoptysis has returned, then a CT of the chest needs to be ordered as well as a referral to pulmonology. If the initial chest radiograph is normal and there is no risk of malignancy, but the history and physical examination points towards a lower respiratory infection, you can treat with oral antibiotics and reassess patient after completion. If hemoptysis has resolved, then no further workup is needed. If hemoptysis occurs again, then a CT of the chest is necessary as well as referral to pulmonology. If the initial chest x-ray is negative, but there are risks of malignancy including being 40 years or older with at least a 30 pack-year smoking history or at least 30 mL of hemoptysis, a chest CT needs to be completed with consideration for referral to pulmonology. If an infiltrate is seen on the chest radiograph, then appropriate antibiotics should be given. A repeat chest x-ray should be done in six to eight weeks to assure resolution. At that time if the chest x-ray is normal, hemoptysis has resolved, and the patient has no risk factors for malignancy, no other workup is needed. If there is no resolution of symptoms, then a chest CT needs to be completed with consultation by pulmonology. If a mass is seen on chest x-ray, the next step is to complete a chest CT to characterize further. Once imaging is completed referral to pulmonology for possible bronchoscopy is recommended. On the chest radiograph, if other parenchymal disease is present, a chest CT should be completed next. If there is still no specific diagnosis found then referral to pulmonology is indicated for further evaluation and treatment. Next the management of patients with massive hemoptysis. These are patients with hemodynamic instability or unstable vital signs. 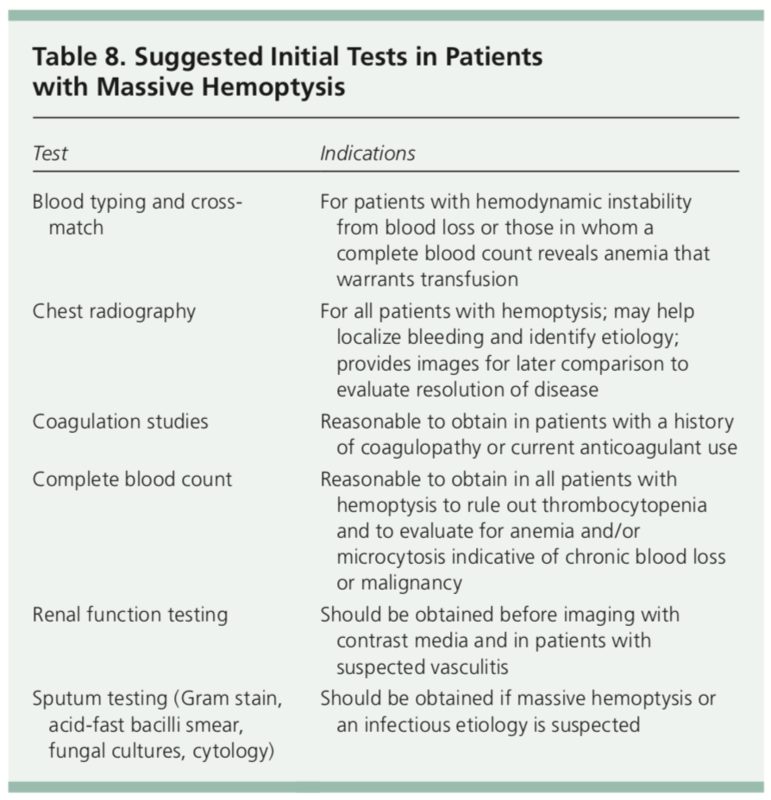 Cases of massive hemoptysis require inpatient management and consultation with pulmonology. Initially, resuscitation with attention on the ABC’s (airway, breathing, and circulation) should be completed before any diagnostic studies are ordered or started. A chest x-ray can give results that may point us towards the etiology as well as direct us with information on further measures needed for evaluation. Once the location of the bleeding is found, the patient should be placed in the lateral decubitus position with the pathologic lung pointing downwards to avoid gathering of blood in the bronchial system. Rapid bleeding is an indication for bronchoscopy and airway maintenance. In patients that are stable with no lesion seen on chest x-ray or bronchoscopy, one should advance with ordering a CT angiography of the chest to gain further information on the next appropriate step in treatment. Bronchial arteriography can be completed in cases where embolization is planned. This is often done after a CT angiogram of the chest since this will help locate where the bleeding is located. Am Fam Physician. 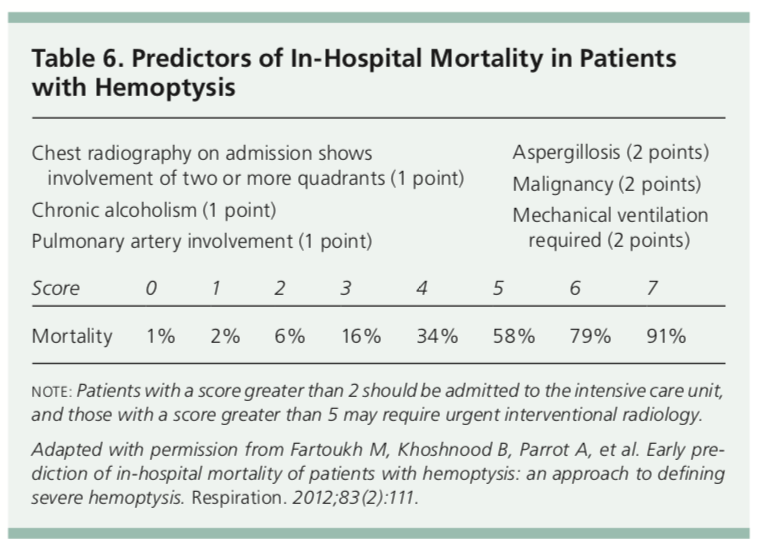 Hemoptysis: Evaluation and Management. 2015 Feb 15;91(4):243-249. Am Fam Physician. Hemoptysis: Diagnosis and Management. 2005 Oct 1;72(7):1253-1260. Ferri’s Clinical Advisor, 2017. 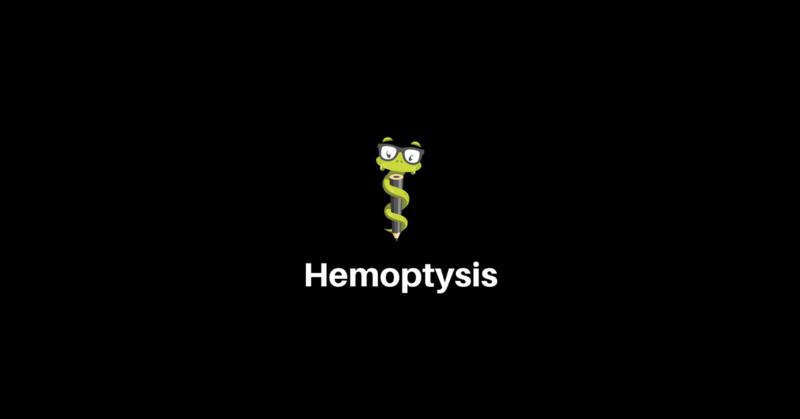 Hemoptysis.